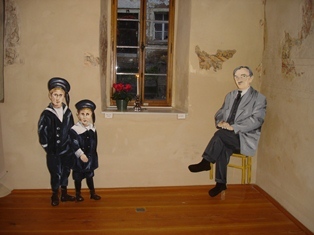 The exhibition in the ancient synagogue at Odenbach was inaugurated on October 26th, 2008 and could be visited until November 23rd, 2008. 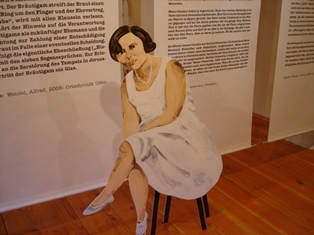 A painting and text project in the ancient synagogue at Odenbach. In cooperation with the board of “Förderverein ehemalige Synagoge Odenbach e.V.” a research of Jewish life in Odenbach was conducted. Contemporary witnesses and families with a Jewish background were interviewed. The documentation did not only consist of personal memories but also of recordings as well as photographies. 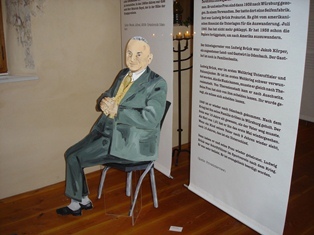 The photos - realized as life sized paintings on thin cardboard - were set up in the synagogue among of interviews printed on text banners. A kind of “walk in picture book” was created in this way. As the exhibition went on Alfred Wendels “Chronicle of Odenbach – volume III – Jewish Life”, presented by Eva Kappesser , was introduced. 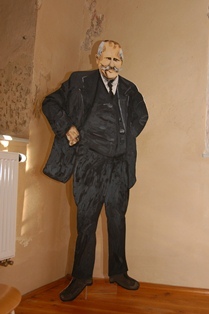 A great variety of photos used for the exhibition are taken from the chronicle. Using the former synagogue as an exhibition room is a great opportunity to combine past and presence: it is appreciated in its former function and simultaneously provides the public a better way to learn about Jewish culture.